Use this DSM CABLES datalogger cable & kit to connect to your odb1 car connection. Used for specific types of cars. Logs: RPMs, Injector Pulse Width, Knock Count,O2v, Throttle Position, Injector Duty Cycle, Timing, Coolant Temp, Air Temp,Barometric Pressure, ISC position, Low-Med-High Fuel Trims, MAF airflow, and More! Also allows you to read and clear any Check Engine Light Codes! Compatible with 90-94 Eclipse, Talon, Laser, Galant VR4, 90-93 3000GT/Stealth, KIA, Deawoo, GM, etc... This diagnostic cable will work with any ALDL compatible ECU. These include vehicles built into the 2000's. The MMCD will work with KIA's and other models that were DSM motors. This diagnostic cable will work for GM, MITSUBISHI, KIA, DAEWOO, SUBURU, etc. If you are looking for an ALDL diagnostic cable and are want to use it for other vehicles besides Mitsubishi, you may need to purchase a scanning software tool. IE. For Suburu, you will need to use EVOSCAN as that is the only ALDL software that will work for Suburu. ALDL PIN OUTS There are 3 different ALDL ODBI pin outs. 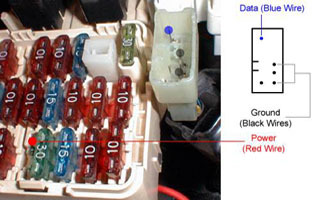 General Motors implemented both a 5-pin connector and a 12-pin connector. Lotus implemented a 10-pin connector. Mitsubishi (Dodge) uses the 12 PIN. The pinouts are included with the README file included when this item is purchased. Software containing the free MMcd (PALM), Palm n' Stein(PALM), and Tuner Logger(WIN) logging programs. No Male to Male or Female to Female DB-9 adaptors needed to log with palm! USB to Serial adapter will be needed if your computer does not have a serial port. ODB-1 Cable, PALM Vx, and software only. You don't need any special plugs to log! Just plug in and go. NO DATA CIRCUITS OR DATA FLOW CONTROL CHIPS REQUIRED! Software for palm and pc with easy how to instructions. If you want to connect to a pc, you will need a db9 female/female adapter. I recommend logging with a palm as it is easy to use since it is more portable. Keep the cable connected at all times if you wish. Cable supports auto on. I hard wired mine in so the palm docks to the car dash for 24/7 logging! 18 gauge industrial strength copper stranded wiring for longevity and strength. Don't be fooled by low end cables like telephone wiring. Other competitors sell solid core or 28 gauge computer wire which will break if bent. All following info has been verified on my Mitsubishi Galant E33A (4G63 SOHC), but it should apply on other pre-OBDII ECUs as well. There's absolutely NO WARRANTY on info and software, you can use it at your own risk. When pin (10) is shorted to ground (12) ECU enters diagnostic mode. In this mode pin (1) is used to exchange diagnostic data with a scan tool. Serial communication is done using 1953 baud, 8 bit, 1 stop bit, no parity, TTL(?) levels. I used the following RS-232 adapter. Software is distributed under GNU GPL. It requires PalmOS 3.5 or higher. You can continously monitor, graph and record a log of up to 32 parameters (sensors). Logs can be reviewed later. Available parameters (sensors) are divided into four banks of up to eight sensors each. Ar the right top corner is sensor bank selector (1, 2, 3, 4). Below are contents of current bank. Each sensor displayed as sensor name and sensor value. Tapping at value (the right part) toggles a graph for that sensor. Tapping at sensor name (the left part) toggles sensor capture (more on that later). At the bottom right is mode selector (Review, Monitor). In Review mode recorded log is displayed inside a graph window. In the middle is a graph window. It can be scrolled using a scrollbar at the bottom or by tapping inside and dragging the cursor. Above graph window is the time when current sample was captured. Graph checkbox toggles between graph and numeric mode. Unchecking "Pause" starts communicaion with the ECU. Selected sensors (ones that have their name highlighted) are polled and graphed. Checking "Log" turns on log writing. Then it can be reviewed later. At the left bottom there's an indication of sample rate and the sensor being polled. Sample rates dropes when more sensors are enabled. Test mode allows read/erase fault codes, activate relays/solenoids and disable injectors. When faults are displayed you can tap code to read what it means. Preferences dialog lets you define 8 custom ECU locations to log, if you know what they mean. Also there's serial communication speed and measurment system for temperature values (Metric, English and no conversion Numeric). Version 1.3 adds audible alarms support for monitor mode. Sor each sensor you can define alarm threshold, polarity (greater or less than) and choose one of 4 sound pitches.